Michael Hudson, author of the newly released J is for Junk Economics, says the media and academia use well-crafted euphemisms to hide fictitious capital, debt deflation and the global economic crisis. Sharmini Peries: Why did you write J is for Junk Economics: A Guide to Reality in the Age of Greed and Deception? Michael Hudson: I originally wrote it as an appendix to a book to have been called The Fictitious Economy. That draft was written before the 2008 crisis. My point was that the way the economy is described in the press and in university courses has very little to do with how the economy really works. The press and journalistic reports use a terminology made of well-crafted euphemisms to confuse understanding of how the economy works. 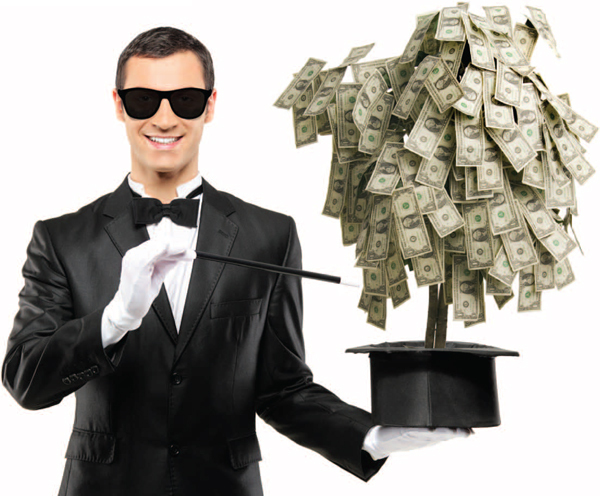 In addition to giving key words to explain what’s positive and how to understand the economy, I discuss the misleading vocabulary, the Orwellian double-think used by the media, bank lobbyists and corporate lobbyists to persuade people that austerity and running into debt is the key to wealth, not its antithesis. The aim is to make them act against their own interests, by drawing a fictitious picture of the economy as if it’s a parallel universe. I’ve met a lot of rich people, and instead of giving people jobs when they buy a company, they usually make money for themselves by firing people, downsizing and outsourcing labour. So you’re not going to get the rich necessarily giving you jobs. But if people can somehow think that there’s an association between wealth at the top and more employment, and that you have to cut the taxes on the wealthy because it’ll all trickle down, then they have an upside-down view of how the economy works. I had written an appendix to the book and that took on a life of its own. If you have a vocabulary that describes how the world and the economy actually work, then one word will lead to another and soon you build up a more realistic picture of the economy. So I not only discuss words and vocabulary, I discuss some of the key individuals and the key economists who’ve made contributions that don’t appear in the neoliberal academic curriculum. There’s a reason the history of economic thought is not taught anymore in the universities. If people really read what Adam Smith wrote and what John Stewart Mill wrote, they’d see that Smith criticized the landlords. He said that you’ve got to tax away their rents because it’s a free lunch. Mill defined rent as what landlords make in their sleep, without working. Adam Smith said that whenever businessmen get together, they’re going to conspire as to how to get money from the public at large – how to do a deal and mislead people that it’s all for society’s good. This is not the kind of free enterprise that people who talk about Adam Smith explain when they depict him as if he were a tax cutter, an Austrian economist or a neoliberal. They don’t want to hear what he actually wrote. So my book is really about reality economics. I found that to discuss reality economics, we have to take back control of the language or economic methodology, not use the logic that they use. Mainstream economists talk as if any status quo is in equilibrium. The subliminal trick here is that if you think of the economy as always being in equilibrium, it implies that if you’re poor or you can’t pay your debt, or you have problems sending your kids to school, that’s just part of nature. As if there isn’t an alternative. That is what Margaret Thatcher said: “There is no alternative.” My book is all about how, of course, there’s an alternative. But to make an alternative, you need an alternative way of looking at the world. And to do that you, as George Orwell said, you need a different vocabulary. To make an alternative, you need an alternative way of looking at the world. And to do that you, as George Orwell said, you need a different vocabulary. SP: You also talked about how businessmen use these terminologies in order to mislead us. We have a businessman in office, as president of the United States, who is proposing all kinds of economic reforms supposedly in our favour, in terms of workers. And you know, the big infrastructure projects he is proposing that are supposed to elevate and lift people out of poverty and give them jobs and so on. What is the mythology there? MH: Well, you just used the word “reform.” When I grew up, and for the past century, “reform” meant you unionize labour, you protect consumers and you regulate the economy so there’s less fraud against consumers. But the word “reform” today, as used by the International Monetary Fund in Greece when it insists on Greek reforms, means just the opposite: You’re supposed to lower wages by 10 or 20%. You cut back the pensions by about 50%. Ideally, you stop paying pensions in order to pay the IMF and other foreign creditors. You stop social spending. So, what you have is an inversion of the traditional vocabulary. Reform now means the opposite of what it meant early in the 20th century. It’s no longer Social Democratic. It’s right wing, anti-labour, pro-financial “reform” to cut back social spending and leave everything in a privatized way to the wealthy, and to the corporate sector. So reform is the first word that I’d use to illustrate how the meaning has changed as it’s used in the mainstream press. Basically, what the right wing has done in this country is hijack the vocabulary that was developed by the labour movement and by socialist economists for a century. They’ve appropriated it and turned it to mean the opposite. There are 400 words that I deal with. Many of these words show how the meaning has been turned upside down, to get people to have an upside-down view of how the economy works. 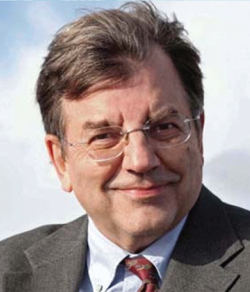 Michael Hudson is a distinguished research professor of economics at the University of Missouri, Kansas City, and author of many books including: The Bubble and Beyond and Finance Capitalism and Its Discontents, and Killing the Host: How Financial Parasites and Debt Destroy the Global Economy. 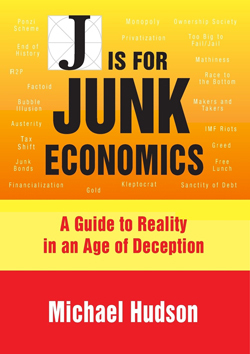 Hudson’s most recent book J is for Junk Economics: A Guide to Reality in the Age of Greed and Deception is an A-to-Z guide that explains how the world economy really works – and who the winners and losers are. The book includes 400 concise acerbic entries, essays, and full topic index. Junk Economics covers contemporary terms that are misleading or poorly understood, and important concepts that have been abandoned – many on purpose – from the long history of political economy. Two key concepts are Rent Theory and Debt, which explain how Unearned Income and the Financial Sector impoverish governments and populations the world over as power and riches flow upward into the hands of the few. Several additional essays provide background for key points and explore today’s uncertain political and economic environment. Doors 6:30, Starts 7:00 PM.